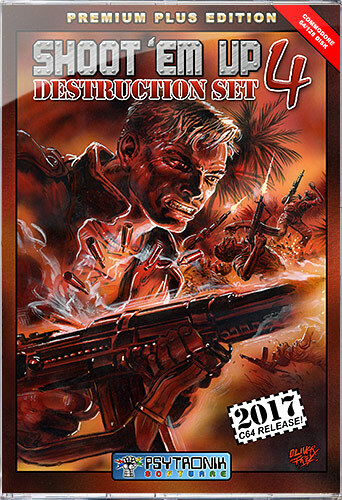 Alf Yngve explodes back onto the C64 with his most ambitious Shoot 'Em Up Destruction Set yet! With this new compilation Alf & the SEUDS team take shoot 'em ups to the next level with massive controllable players, superb use of hi-res graphics, clever gameplay mechanics, awesome sonics, eye-popping presentation and MORE destruction than ever before! The FIREBIRD was defeated in the original TAU ZERO game - now it's back, stronger than before, and headed for Earth. Blast off and save us all in this frantic shoot'em-up that features detailed hi-res graphics, ear-pounding soundtracls, power-ups and frenetic blasting ACTION! It's 60 tons of armored destruction... all under your control. You call it BIG GUN NUMBER ONE! In this sequel to DOUBLE OR NOTHING, you face the strangest conflict in history. You fight in two parallel realities, to save reality itself from breaking down. You can win -- for you have the edge of time! You are a mercenary -- a gun for hire in the Expendable Army. Your task is to overthrow a dictatorship in a small South American country. The ultimate goal is to reach the dictator himself... and bring him down! You have been selected to test the GIGABLAST - a devastating new superweapon.